Let's show mew what was in the box. As usual our resident 'Foodie', Fudge was furst to inspect the merchandise... but Amber soon muscled in and said. "Dude move offur, it's ladies furst!" Watch out video to see how we got on! 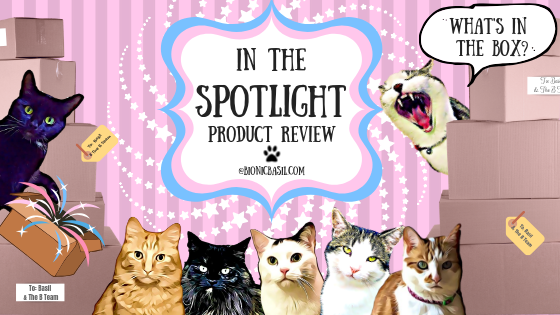 To find out all about Blink cat food, just click the link below and go check out all the yummy pawesomeness fur yourselves! We would like to say a special thanks to the pawesome peeps at Blink fur giving us the oppurtunity to try out their yummy, scrumptious food and treats ~ THANK MEW FURRY MUCH! Many thanks fur joining us today and don't furget to stop by tomorrow when we will be blog hopping around the wurld on the Pet Parade. That was a terrific review of that yummy yum! First I've heard of this cat food. Excellent review. Glad the food was tasty! I love your food plate/bowl! Fudge was very eager to try with trying to get in the box! Looks like it went down a treat.